This park protects a spectacular limestone canyon and falls (the Notch) on Oregon Jack Creek, as well as wetlands above the falls. This area is very significant for historic First Nations use. Please note that no camping or day-use facilities are provided. This park protects the geological features, wetlands, upland forest habitats and cultural features associated with this area. This is a wilderness area with limited patrols by Park Ranger staff. Water taken from local creeks or streams should be treated or filtered before consuming. There are no developed trails. Visitors hiking in the area should have good route finding skills. Hikers should be prepared for map-and-compass orienteering. 25 km southwest of Cache Creek. Access is from TransCanada Hwy # 1, 17 km south of Cache Creek, turn onto the Hat Creek Rd. Follow this road, which bisects the park, for approximately 12 km. History - Established on April 30, 1996 as a result of recommendations made in the Kamloops Land and Resources Management Plan. Cultural Heritage - This location, with its waterfall and high limestone cliffs, has long been an important area for native ceremonial, spiritual and sustenance activities. Rock pictographs and culturally modified trees are located within the park. The park also contains the culturally significant 3 Sisters rock shelter. Please do not touch any pictographs as the natural oils on your skin will cause deterioration of the colour pigments. Conservation - Oregon Jack Provincial Park protects the limestone canyon and falls on Oregon Jack Creek. 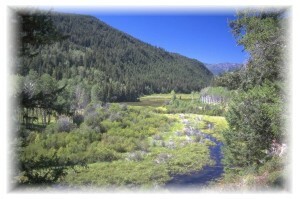 Old-growth Douglas fir grows on the steep north slopes, with wetlands and aspen stands along the creek above the Notch. Wildlife - The area is noted for black bears throughout the park, and both moose and waterfowl in the marsh wetlands of the western section of the park. Hunting is permitted only during lawful game hunting season. Check with Hunting and Trapping Regulations Synopsis for regulations. Pets/domestic animals must be on a leash at all times. You are responsible for their behaviour and must dispose of their excrement.Backcountry areas are not suitable for dogs or other pets due to wildlife issues and the potential for problems with bear. No firewood is available and no fire rings are installed. The gathering of firewood in a Park is illegal, so fires should only be used for emergency drying and warming. If a fire is used for an emergency, please keep it small, and ensure it is completely out before you leave. Use a camp stove for cooking.